When looking for my family on online genealogy web sites, I often find that people are listing that my Pomeranian ancestors are from the village of Pommern, Cochem-Zell, Rheinland-Pfalz. I have copies of the church books from the town where my Pomeranians came from and they are NOT from Pommern, Cochem-Zell, Rheinland-Pfalz. The lesson to be learned here is: Do not trust the internet when researching your family from Pomerania. Do your own research and don’t trust anyone’s family tree unless they give sources you can believe or check out yourself! What and where is Pommern, Cochem-Zell, Rheinland-Pfalz? What and where is Pommern (Pomerania)? 2013 was 437 people and this city has probably never been much larger at any time in history. Pommern is the German language name for Pomerania, as we say it in English. Pommern is a historical region which is now divided between Germany and Poland. Formerly Pommern was a Province in the kingdom of Prussia. Pomerania is a region on the southern shore of the Baltic Sea in northern Europe. Pommern was once 11,621 square miles which is about 20% the size of Wisconsin. In 1871 the population was 1,431,796. 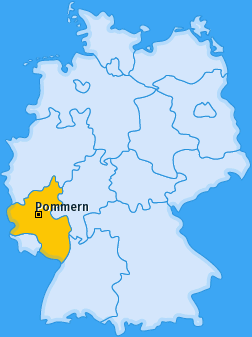 Pommern, Rhineland-Palatinate is in the far west side of modern day Germany. The Province of Pommern is in the north east of Germany and Poland. Pommern the city and Pommern the province are not at all close to each other. So if all of the thousands of people I find on the public family tree sites such as Ancestry.com, FamilySearch Family Tree, My Heritage, etc. are really from Pommern, Cochem-Zell, Rheinland-Pfalz, I don’t think there could possibly be anyone left living in that small town of 437 people. But this town still exists in modern day Germany, and it must enjoy a lot of tourism since so many people think they are descendants of people that left from that place. If your relatives came from Pommern they almost certainly came from the Province of Pommern which was a much larger area and which had many people who emigrated to the United States. In order to know where your people actually lived, you need the town name (which is not Pommern). How did it happen that so many people entered the wrong place name in their online family trees? It seems that Ancestry and many other web sites use a drop down which is an auto-place name device. When Pommern is typed into a place name field it automatically brings up choices from which to be picked. At one time Pommern automatically brought up Pommern, Cochem-Zell, Rhineland-Palatinate, Germany as the first choice. Now that choice has dropped to third place in the list. If the actual place of origin is not known, use the first choice which is usually Pommern, Poland. Every time I see an online family tree with Pommern, Cochem-Zell, Rheinland-Pfalz, I am immediately suspicious that this information is incorrect, and I wonder what else is suspect in that tree! In conclusion, do you think your people came from the small city of Pommern which has 437 people, or did they come from the larger Province of Pommern which had over 1 million people? That being said, should you believe the many online family trees that say your ancestors came from Pommern, Cochem-Zell when they provide no documentation on place of origin?